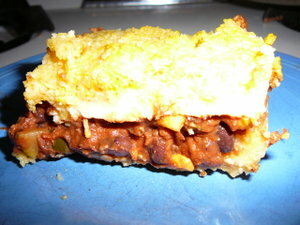 I love Amy's Tamale Pie. So for tomorrow's potluck at church I thought I'd try making my own version of the dish. I've searched for recipes online and this is the one that I've used the most to base my own recipe off of. But I've made several modifications (mostly trying to draw it as close to the Amy's version as possible). 3. In a separate pan, saute onions until translucent. Add corn, zucchini and any other veggies (or tofu) that you might want to toss in. combine cooked beans (which can be mashed with a potato masher, leaving some whole) with other ingredients except cheese. Cook over medium heat until vegetables are almost cooked. Pour into baking pan and spread evenly. Sprinkle grated cheese on top and spoon on remaining cornmeal mixture. 4. Bake at 350F for 25 minutes. Having salt in your bean water makes them take longer to cook. Always add your salt near the end. Cooking them in stock (well, stock with salt) will always prolong the cooking times. I don't know why, I just know that it does. Salt makes the beans tough. well, next time i make this i was gonna go with canned beans. but maybe i'll try the whole thing over again without the salt... until the end. Also, really OLD beans can take forever to cook. Well, I had just bought them, but who knows how long they'd been sitting around in the store? Old beans lose a lot of their nutritional value. I try to be careful of those. Sadly, I sometimes get a pot that I know takes to long to cook. oh wait. looks like britney beat me to it. that's interesting. i didn't know they'd do that. i thought deleting the spammer was their job and deleting the spam was mine. ah, well. back to work i guess, then. Why wait to add salt? When cooking beans, the more dissolved stuff in the water, the harder it is for the water to soak into the beans. In chemistry it's called osmosis. A liquid with salt attracts water from things that don't have salt. So your beans are working against that. Also, best not to add tomatoes or acidic things early in the cooking process, that makes the outsides less porous. In italian cooking, beans are supposed to be firm on the outside and soft inside, so they do add salt and acidic stuff (but not lots) so that the beans are al dente. Also, with slow cooked dishes (baked for 4-6 hours or longer, like cassoulet) you don't want the beans to get too mushy. Then salt and tomatoes or wine are added.